We’ve been working with BleepBleeps for some time and we’re mega excited to have helped them successfully fund their third product Benjamin Brush! He’s a fun wee guy designed to get kids brushing their teeth. We produced all the creative assets including photography and the video. We worked with press and bloggers to get feedback and spread the word about Benjamin. Here’s the video we made for BleepBleeps! We received lots of great feedback from the press, bloggers and influencers we got in touch with too. Here are just a few of our favourites from Fast Company, Mashable, Swiss Miss and Core 77. Thanks Bonnie for the photo. Last week we brought loads of makers + creators together to talk about their projects and share their Kickstarter experiences at the very first Glasgow Kickstarter Meetup. We had talks from Heather Corcoran from Kickstarter, Danny Kane from Filament PD, and both Vanilla Inkers Kate Pickering + Scott McIntyre. They shared their Kickstarter experiences, and gave some absolutely smashing tips. Two exciting makers; Curious Chip + Soundbops brought their prototypes along and it was great to see people sharing ideas and inventions. The wonderful Vanilla Ink have turned their talk into a really handy (and honest) blog post and you can catch up on the rest on Twitter. We're thinking about running these every six months or so, if you're interested in getting involved or have any feedback please get in touch and let us know. We are all ears, not literally that's just weird. It's time for some more Gold Nuggets where we talk with some of our most loved makers, founders and do-ers. Digging into their stories to reveal tips, precious wisdom, and even some music to get your under-the-desk feet dancing. In this edition we’d like you to meet one of our favourite couples, John Nussey and Avril O’Neil from Ding, a project we helped become successfully funded on Kickstarter. Hi! We're Avril and John, and with support from The Design Council, John Lewis and our amazing backers on Kickstarter we’re launching Ding. Ding is a simple, beautiful, smart doorbell that’s perfect for your home and makes your life easier. When a visitor presses the button, the chime rings in your home and also connects to the Ding app on your smartphone, allowing you to talk with the person at your front door from wherever you are in the world! What’s the one thing you wish you knew in your first year? There's a lot I wish we'd known in our first year! Making a physical product comes with many challenges and it's hard to know what to prioritise. In all honesty we don't have many regrets, as we've learnt so much through the experience. The one thing I think we wish we'd had was a way of meeting and expanding our team quicker. We have secured an amazingly talented team, including the guys at PWG, but it took a lot of searching to find them. What are your top 3 tips for how to best use funding? Tip 3. Invest it in the company, rather than using it as an income, get your product out there sooner. What was the best bit of advice you were given and who gave you it? Make the business work for you and don't be a slave to any other formulas or compare yourselves to others too much. What’s your ambition for Ding? On a personal level it is to see a product we've made out there in the world, solving a real need. In the bigger picture it's to make IOT products that have a genuine benefit for people, rather than producing technology for technology's sake. What song motivates you in the studio and why? Paved With Gold are excited and honoured to be founding members of Kickstarter Experts. We’re so proud that Kickstarter loves what we do and the projects we work with. To celebrate we wanted to share some of the Kickstarter projects our founders Richard and Kaye helped get funded, and the amazing things those projects went on to do. Foldable.Me allowed you to design a personalised buddy online. Your Foldable would then arrive on your doorstep pre-cut and scored, ready for you to put together. They went on to take over the Kickstarter staff page for April Fools, and thousands were even sent to support Fair Trade in London’s Parliament Square! Our favourite tiny little Instagram projector was a Kickstarter success being the first European company to reach its Kickstarter goal within 24 hours! It’s popularity led to collaborations with fashion brands like colette and Opening Ceremony, and because of its beautiful design was proudly put on shelves at the MoMA design store. The connected (IoT) ball raised over $240,000 which put it in the top 1% of most successful Kickstarters in terms of performance. Hackaball really resonated going on to be awarded ‘Best in Book‘ by Creative Review and becoming one of TIME’s best inventions in 2015. 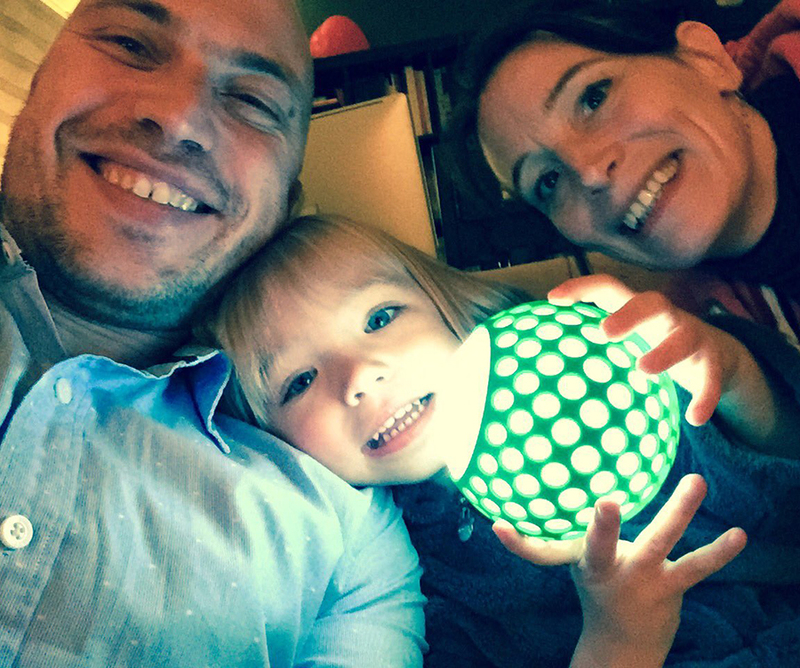 We’re delighted to see Hackaballs landing all over the world and inspiring a new generation of makers (and their parents!). Mover Kit is the first wearable that kids make and code themselves. Unlocking the mysteries of new technologies. After reaching their goal in just 48 hours, and being featured in every possible publication we could find, Mover Kit, and the entire Tech Will Save Us range, has now taken over an entire section of the Design Museum in Kensington. Sammy Screamers have already been sent all over the world, and joined collections at MoMA and the colette store in Paris. Their second product, Suzy Snooze was recently successfully funded and is going to ship very soon. We’re excited to be working with BleepBleeps again to help launch their third product early next year, adding to their collection of cute devices that make parenting easier. One to watch out for, the Ding Smart Doorbell which Fast Co simply said “gets the Internet of Things right”. Stuff magazine included Ding to make John’s eyebrows dance like never before. We hope you enjoyed our little trip down memory lane. A huge thanks to Kickstarter and everyone we’ve worked with to help bring these amazing projects to life! We’re looking forward to launching and growing more ideas!